US, 2006, 89 minutes, Colour. Voices: Julia Roberts, Nicolas Cage, Meryl Streep, Paul Giammati, Zack Tyler Eisen, Regina King, Bruce Campbell, Lily Tomlin, Larry Miller, Ricardo Montalban. Directed by John A. Davis. One of the features of the animated features of 2006 is the environment with the villain being the pest controller with his barrage of sprays and poisons. In Over the Hedge, he is called in to get rid of the animals who have invaded a suburban garden in search of food, with Bruce Willis voicing a hungry racoon who has upset a hibernating bear and taken all his food, and who now has a week to build up supplies. Children will enjoy the drawing, the action and the slapstick comedy while parents will enjoy the dialogue and the voices. However, the film that could succeed with both children and adults is The Ant Bully. Once again, the villain is the pest controller (voiced by Paul Giamatti) who is called in to destroy a front lawn ant hill. Our point of view is that of the ants. They are afraid but try to survive the onslaught. The title is strange at first. But, once we have identified the Ant Bully, it begins to make sense and it also leads us into the message of the film. It is really a moral fable. Lucas Nickle (voiced by Zach Tyler) is bullied by the local kids, especially Steve who keeps pointing out that he is bigger than Lucas and can force him to do anything. The trouble is, as we know, that those who are bullied can then take it out by bullying others weaker than themselves. Lukas does this to the ant colony because he is bigger than they are. So, he fires his water pistol at the ant hill and starts kicking it down. We, the audience, have already met the ants and seen just how diligent they are in collecting the food for the colony. We get to know some of the personalities, especially Zoc (voiced by Nicolas Cage), the ant wizard who is experimenting with spells and potions. One of these is successful in reducing Lucas to the size of an ant. 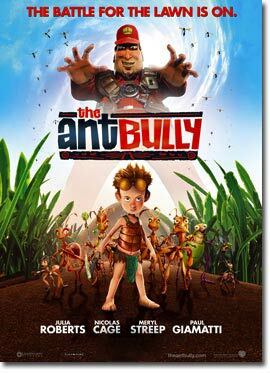 The Ant Queen (voiced by Meryl Streep) sentences Lucas to work with the ants and to learn what it is like to be an ant. Tutor Hova (voiced by Julia Roberts) trains him in the life and the work. Lucas resists at first but then gets a sense of achievement. Unfortunately, before he became ant-size, he had rung the controller. Now he has to work with the ants (and collaborate with former antagonists, the flies and other insects) to save the colony. The film was released at the height of the conflict between Israel and Hez-bollah the bombing of Lebanon and northern Israel. One can’t help noticing the similarities in this little fable – and its message of tolerance leading to understanding and collaboration. 1.The quality of the animation? Entertainment? The voices? The moral? 2.The visual style, the drawing of the characters, the drawing of the ants, the ants’ activity, the anthill? Editing and pace? The battles? The struggle against the Exterminator? Colour, style? The musical score? 3.The title, Lucas and his being bullied by the boys, his taking it out on the ants, his having to learn, experience the life of the ants? 4.Lucas, the little boy, his relationship with his family, their being away, the other boys? His reaction, his kicking the anthill? His ringing the Exterminator? The consequences for when he returned? The fight against the Exterminator? His coming back to normal size, the confrontation with the bullies, his being accepted for who he was? His learning his lesson? 5.The quality of the voices, Julia Roberts and Nicolas Cage? The comic voices? Lily Tomlin as the grandmother? 6.The picturing of the anthill, the detail of the ants at work? The suburban garden? The introduction of the character of Zoc, as the wizard, working on the potion? His friendship with Hova? Lucas attacking the anthill, the water pistol, the flood? The ants calling him the Destroyer? Zoc and the success with the potion? The arrival of Stan Beales? The decision to shrink Lucas, taking him to the anthill, the potion? His being brought before the Ant Queen, her decisions, the sentence, earning his freedom, living and working with the ants? The appointment of Hova as Lucas’s mentor? Her unwillingness? Lucas and his resisting? His stances, superiority? His change of heart, the affirmation by Hova? The mission, the food, going to the house, trying to cancel the contract, the pizza parlor? The ants and their confrontation with the flying insects, the frog, eating him, the rescue by Zoc? The ant cave, the Cloud Breather – the artwork, Beales as the Cloud Breather? The ants and their collaboration, the flying insects, Lucas? The confrontation with Beales? Shrinking him? His escape on the bike? Shrinking? 7.The characters of the ants, Zoc, genial, the wizard, concern, leading the ants? Hova, girlfriend, nice, stern with Lucas, helping him, affirming him? The Ant Queen as regal? The training sessions, the humour with Kreela and Fugax? 8.The humans, Mommo, the grandmother, Lily Tomlin’s style? 9.The happy ending? The parallels with wars, invasions, oppressed people and rebellions? Walking in the shoes of those who are oppressed? Learning lessons of tolerance and understanding?